When he arrived in the United States from Gambia at the age of five, Freedom Middle School eighth grade student Muhammad Sosseh could barely read or understand English. Today, Sosseh cannot imagine a world without English literature. His passion and dedication for reading the English language has helped him earn attention, accolades and awards—and once again put DeKalb County School District (DCSD) achievement at the forefront. Sosseh recently claimed first place for the 6th- 12th grade division in an essay contest hosted by the Georgia Reading Association, also known as the Bob W. Jerrolds’ Reading Achievement Award. 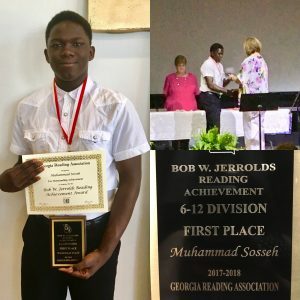 The Freedom Middle eighth grader was honored at the Georgia Reading Association’s most recent annual ceremony in Byron, Georgia. Students were instructed to submit an essay with the theme, “What Reading Means to Me,” and judged on the effectiveness of language, attitude toward reading, variety of genres, grammar, and the overall amount of time spent reading. Sosseh—who has checked out more than 2,000 books over the course of eight years at DCSD—made judges’ work easy. “I have never met a student with over 2,000 books checked out during their eight years of matriculation in DeKalb County School District,” said teacher-librarian and Helen Ruffin Reading Bowl coach Pamela Taylor, who nominated Sosseh for the award. Taylor calls Sosseh a student leader who willingly helps his peers with reading. He is also an honor student, a member of Freedom’s Elite Book Club, and a proud member of the school’s Helen Ruffin Reading Bowl team. Sosseh’s love for reading began when he first arrived in America. His father would take him and his sister to the DeKalb County Public Library in Clarkston each week to check out books, which helped him learn the alphabet and new vocabulary. By the time he could read, recognize new ideas, and learn new concepts, Sosseh was hooked. Sosseh credits the act of reading’s ability to transport the reader and impart an endless amount of knowledge.